Himalaya Liv 52 Tablets contains Himsara and Kasani as active ingredients. The Ayurvedic formulation has hepato-protective function and it helps to improve appetite. Packaging Size: 1 x 250 Tabs. Packaging Type: A plastic jar pack of 250 Tablets. Packaging Size: Available at all chemists in PACKS of 60, 5x30 & 1000 Tabs. In order to cater to the numerous necessities of the patrons, we have been able to provide a wide range of Felve Ayurvedic Tablet. We are leading manufacturer and supplier /Exporter of Ayurveda Livobliss Tablet in India. 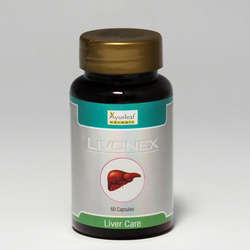 Rejuvenates liver and thereby enhances the regenerative ability of the damaged Liver tissue. Improves appetite & enhances absorption and assimilation of nutrients from food. 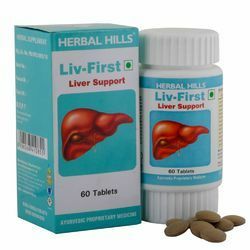 Liv-First a 60 Tablets pack The selection of herbs in Liv-First is based upon a long standing use as a traditional solution to support the body's natural ability to regulate the Liver functions.